Imagine reaching into your closet and always pulling out a favorite piece. We often let emotional attachment get in the way of donating clothing that doesn't fit or just doesn't work in your life anymore. Time to let go, this list will help. When you're done you'll have a streamlined "European" style closet where every piece is selected/kept with care and getting dressed is simple. Less is more! I may make custom art for the closet area too, I love art everywhere! Left side: Boyfriend clothes (he stays the night often), my t-shirts, excess packaging materials at bottom. Right Side: Blouses, Bottoms, Dresses, shoes, unseasonable clothes in boxes at the top. Step 1) PURGE. Be Brutal: Be a brutal editor. Get ALL pieces that don't fit or make you uncomfortable in ANY WAY (pulls, pinches, sags, shows your crack!) out of the closet and into a box. Step 2) Set Aside Seasonal Clothes: Put all out-of-season clothes in boxes until you can wear them again. I keep mine in boxes at the top my closet and in my carry-on luggage cases. Step 3) Re-Arrange: Group your shirts, shorts, pants, etc. together at this point so it's easy to reach in and find your quarry every day. I hang ALL my clothes, I love skipping folding and ironing! Step 4) Revisit the Purge: Go through your "purge box" with emotion removed (tips here). Put the repair pieces in a box by your sewing machine (or in your car to take to mom!) so they're fixed fast. Set aside a couple "too small" pieces to wear when you lose weight, but purge brutally there. You deserve to treat yourself to new pieces once you hit your goal weight. Step 5) Continue the Process: Now you can hunt for any vital pieces you may be missing, but keep to a one-thing-in, one-thing-out rule. When a piece breaks or I feel uncomfortable in something temporarily I toss in a box at the top of my closet. I revisit the box at the end of the month and donate/fix pieces as needed. 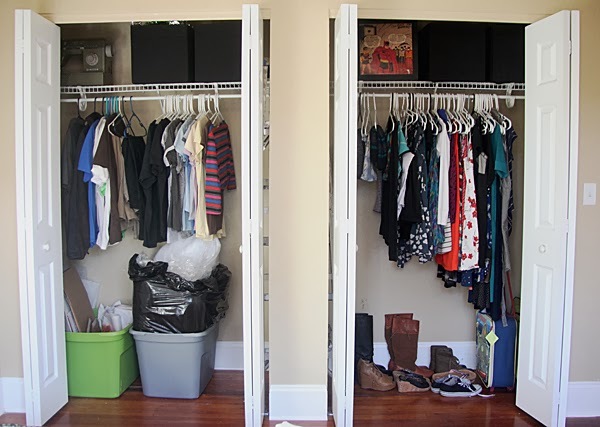 How do you keep your closet clutter-free? Any additional decluttering tips (or style tips) to share? I'm constantly pruning my closet. Two things that have helped lately - 1. limiting my color palette to blues, greens and neutrals. 2. Accepting the human desire for novelty. No matter how much you've got, you want new stuff, too. So, as you said, see your closet as a revolving door - new stuff in, old stuff out. I almost included the color palette tip but I'm decided to keep that in the "developing style" post. I look best in black/white/blues/greens/hot pink and saturated cool tones, no pastels so I keep to those colors. Those are colors I happen to love anyway so it really worked. I break the rules and pops of colors but even when you look at the photo you see I stick to those color rules. I deleted it for space but should add the tips about thrifting for clothes if there happen to be any uninitiated to thrifting creating. I've found designer clothing for literally pocket change at the Goodwill pound store and yard sales and in perfect quality. I love that you can be super cheap with clothes and still be stylish. I don't even use most of my closet for clothes. I use it for random storage. And it gets out of hand. Real out of hand. The expedit unit from IKEA and the boxes are helping me concentrate all work storage in one area. More on that and the matching spreadsheets soon. But the closet has on-and-off become work disaster zone. Wow. Nice closet. I can really learn a thing or two from you. One of the ways I try to stay neat is taking a shelf in my closet and filling it up with unworn clothing. If after a year, I have not warn the selected few items, I find it easier to get rid of. I love the one-year rule for -everything-, too. Most of the time when you set stuff aside you really won't touch it for a year. After that it's much easier to let it go. Love your organized closet, thanks for the inspiration. No prob, excited to share more organization tips into the future!